Feral cats deserve a second chance. Most Marin County residents are surprised to learn they share their neighborhoods with thousands of feral cats. These kitties are descendants of domesticated felines who strayed from home or were abandoned. They’re unaccustomed to human contact and often form colonies made up of dozens of other ferals. If feral cats aren’t spayed or neutered, the colonies grow astonishingly fast. Sadly, euthanasia used to be the common answer to feral overpopulation. Fortunately, it’s now generally recognized that widespread euthanasia is not only inhumane but ineffectual; unsterilized cats breed so rapidly that euthanized animals are quickly replaced by newborn kittens. TNR, or trap, neuter and return, has proven to be a highly effective and humane way of preventing colonies from growing uncontrollably. Once all the cats in a colony have been sterilized, the size of the colony diminishes naturally with attrition. Although living outdoors is not as safe or as comfortable as living in a home, it’s the best possible outcome for many feral felines, provided someone is willing to feed them and monitor their health. In some cases, adoption is a possible option for feral kittens as well as adults, provided they tolerate being handled by people. Marin Humane places these cats into foster homes, and if they become socialized to humans, they can become available for adoption. This is most successful with kittens, but adult cats have been known to end up as great pets, too. 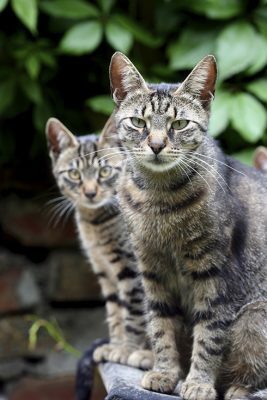 We can connect you to organizations that will safely trap feral cats so that they can be spayed or neutered, such as Marin Friends of Ferals, based in San Rafael. Some veterinarians are willing to spay and neuter feral cats, and Marin Humane Society provides vouchers that cover up to $85 of the cost of the surgeries.